A fleet of four specialist trains and a new and improved timetable will help keep customers moving on the Cross City line this autumn. Network Rail and West Midlands Railway have drawn up a revised autumn timetable designed to keep passengers travelling without disruption in and out of Birmingham New Street during morning and evening rush-hours. 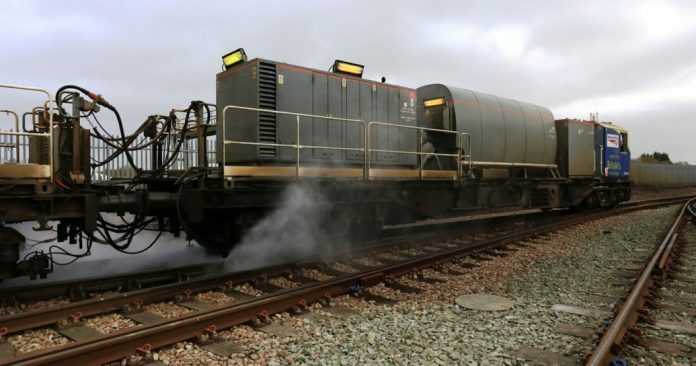 Meanwhile four specialist trains, known as leaf-busters, are blasting leaves off the line using high-pressured water jets as part of the annual effort to tackle the widely-mocked problem of leaves on the line. The leaf-busters’ jets are so powerful that if they sprayed one spot on the track continuously, the water would cut straight through the steel rail. On the Cross City line alone, nearly a million litres of water will be used to remove leaves from the tracks. The leaf-buster trains will cover more than 6,000 miles en route between Lichfield, Redditch and Bromsgrove, via Birmingham New Street, during the 10-week treatment period. The reality of leaves on the line is no joke: they get flattened onto the rails by trains creating a Teflon-like, slippery coating which limits trains’ ability to accelerate or brake – rather like cars driving on black ice. The outcome is a disrupted timetable as trains, which can weigh several hundred tonnes, need more time to start and stop and must travel more slowly through affected areas. That’s why Network Rail and West Midlands Railway have developed an ever-improving autumnal plan to help keep passengers moving. Martin Colmey, current operations manager for Network Rail’s London North Western route, said:“Leaves on the line is no joke. If we didn’t work to remove them, their impact on train passengers wouldn’t be funny either. “They have the same impact on the railway as black ice does on roads, making it impossible to drive a train normally. Richard Brooks, customer experience director at West Midlands Railway, said: “Autumn time poses a number of significant operational challenges for rail operators around the country and causes us particular issues on the Cross City Line, which is often subject to delays caused by slippery rails. Cllr Roger Lawrence, chair of the West Midlands Rail Executive, said: “In the past we have had to reduce or slow services during the autumn leaf fall period, but thanks to our joint working with Network Rail and West Midlands Railway we will have these four leaf-busting trains keeping the rails as clear as possible during this 10-week period. “It means that while there will be some changes to services, our peak time commuters on the Cross City line will be able to take their regular journeys into Birmingham New Street during the morning and out during the evening without disruption. The autumn timetable will operate from Monday 15 October until Friday 7 December 2018, affecting services from Lichfield, through Birmingham New Street, to Redditch and Bromsgrove. Some trains will have an amended stopping pattern on weekdays. A normal timetable will operate from 8pm in the evenings and at weekends. For all the information, visit www.westmidlandsrailway.co.uk. The treatment trains can also apply a special gel which increases trains’ grip on the tracks in key areas. Sand is also carried on many passenger trains and released in front of the wheels to help boost grip on the rails. Across the West Midlands and up and down the West Coast and Chiltern main lines, the four trains will cover a total of 25,000 thousand miles this autumn and use more than 10 million litres of water.